We feel very please to announce the addition of product in our Derma Product Portfolio. Treating certain fungal infections of the skin. It may also be used for other conditions as determined by your doctor. 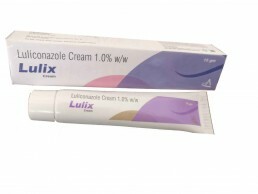 Luliconazole is one of the most lucrative product launched in the anti-fungal range of creams and ointments both in terms of efficacy and margin of profit. Being a leading Luliconazole Cream Suppliers, Trumac Healthcare is the first company in Chandigarh to launch this product under its pharma franchise model.